Coastal California in January is not half bad. It’s not exactly beach weather every day, but it has been the past few days, and so that’s where we headed. 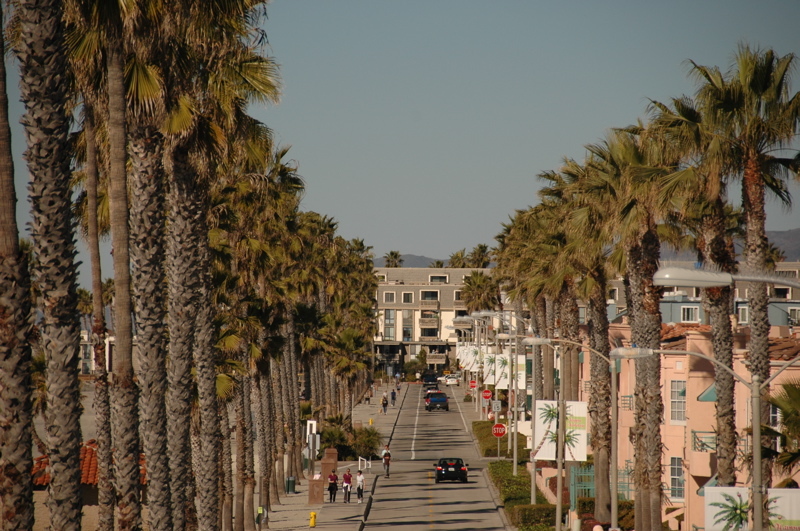 Up in Oceanside, 30 miles or so north of San Diego, there’s a county park called Guajome, and it is conveniently just a few miles east of the Oceanside beach and pier. We pulled the Airstream up there and settled in for a couple of days. On the way we dropped in on the newest Airstream dealer, Holland Motorhomes. They are replacing the previous dealer, which went out of business recently. They’ve got a few Airstreams on the lot, but they aren’t ready to provide service yet. I think they were surprised to hear from us. There was another Airstream owner parked just across from us in Guajome, but we were barely at the park long enough to socialize. We chatted a bit and then headed out to do some shopping at a couple of local ethnic markets (Mexican and Phillipino). Eleanor and Brett have been cooking up all kinds of different dinners lately. I’m just sitting back and eating whatever they make, so far with excellent results. The only questionable item was a brutally hot but delicious guacamole they found in one of the markets. It was painful to eat but we couldn’t stop because it was so good on fresh-from-the-bakery tortillas. 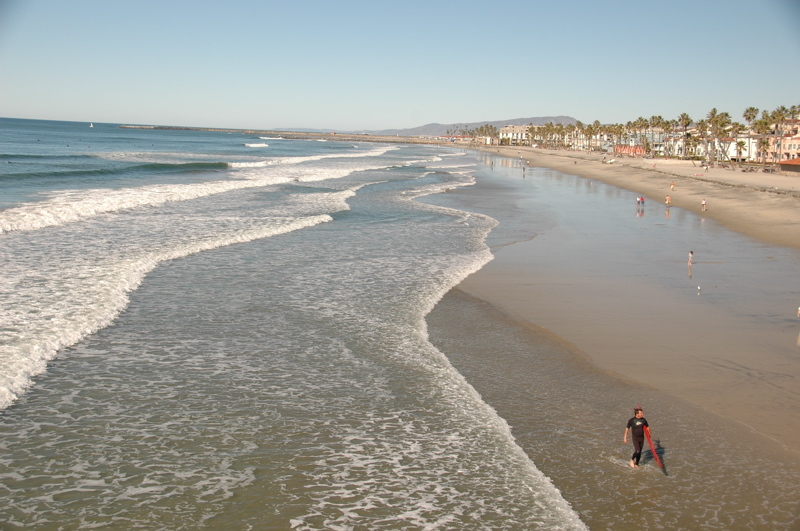 In downtown Oceanside there is a long beach and a long pier, ideal for photo practice. Brett has a new Nikon D90 (the camera I want but haven’t yet bought) and so we decided to spend the day shooting pictures of the beach area and the surfers. I’ll set up a photo album on Flickr with the best shots later. Emma spent her time on the beach looking for shells, and rounded rocks to paint. With wandering around town and hiking the beach, we ended up being out until sunset, and getting back to the Airstream just in time for another massive ethnic food-fest. Lately I haven’t been talking about maintenance, but it has been on my mind. A strange squeal started in the trailer brakes a few days ago, only when they are hot. On the tow north from Oceanside on Sunday, we got a high-pressure alarm from the tire monitor, and pulled over in Temecula. (The tire monitor is set to alarm at 10 psi above the cold pressure.) We felt the wheel and it was definitely hotter than the others, which usually means either a dragging brake or bad wheel bearings. Given that our wheel bearings were re-packed only 1,000 miles earlier, and that this wheel’s entire brake assembly was recently replaced by an Airstream dealer —who shall not be named —at great expense, I suspected a brake problem. So we walked the Old Town of Temecula, to see what has changed in the 15 years since we were last here, and waited for the wheel to cool down. I can’t say much for the improvement of the Old Town. I remember a quiet historic district mostly occupied by antique stores, but we found a typical tourist district filled with stuff and restaurants, motorcycles rumbling down the main street, all about retail. I’ll spare the details, but the high-temperature tire did indeed turn out to be caused by a brake problem. Somebody re-assembled the brake and failed to lubricate the caliper guide pin. It was completely dry. That meant the brake caliper wouldn’t release properly, which meant the disc brake pads would drag and generate heat. Which it was doing for the past thousand miles or so … Fortunately, we caught it before the pad burned up and took the rotor with it. Since were doing maintenance, we also took the opportunity to install a new vent fan in the forward location. I’ve had a vent up there that has not been working out well for various reasons, and recently obtained a new Maxxair “Maxxfan 6200“. So Brett climbed up on the roof, removed the old fan, and popped in the replacement. It’s pretty cool. Not only can we run it in the rain, but it has a very slick remote control, stainless steel hardware, a much faster open/close speed, and a better designed roof flange that seems less likely to develop leaks over time. This is the first Maxxair I’ve owned but I’m fast becoming a, uh, fan of them. We put a strip of adhesive velcro on the back of the remote and now it’s conveniently hanging on the bedroom wall. Our next stop is Death Valley. Before we head into a remote spot like that we try to get everything in order, so we’ve parked in Riverside County for a couple of days We searched for and (hopefully) have fixed a small rain leak around the kitchen vent fan. We also lubricated the stabilizers to eliminate an annoying squeak in them. I took the Nissan into the local dealer for replacement of some worn-out bushings on the air bag compressor (part of the Nissan’s auto-leveling system). Eleanor topped up our groceries, and I filled both propane tanks. Our friends Terry and Marie have been visiting with us, so last night we piled everyone in the Airstream for dinner and movie night. I took the opportunity to experiment further with the new ultra-wide-angle lens I bought in San Diego last week. There are definitely a few tricks to getting good photos with it, and I am having fun learning how. The photo below shows the incredible views it can reveal — just what I needed for shooting Airstream interiors. It will come in handy in the next two weeks, when I will be shooting both Death Valley landscapes and new Airstreams in Las Vegas. I’m sure you get a lot of comments about the value that you provide to the RVing community but I would like to state specifically that your notes on maintenance issues are incredibly valuable. This is especially true since you are experiencing them first hand. The importance of monitoring for increased tire pressure is not obviously intuitive. Your illustrative example identifies a scenario that not all of us would have considered. 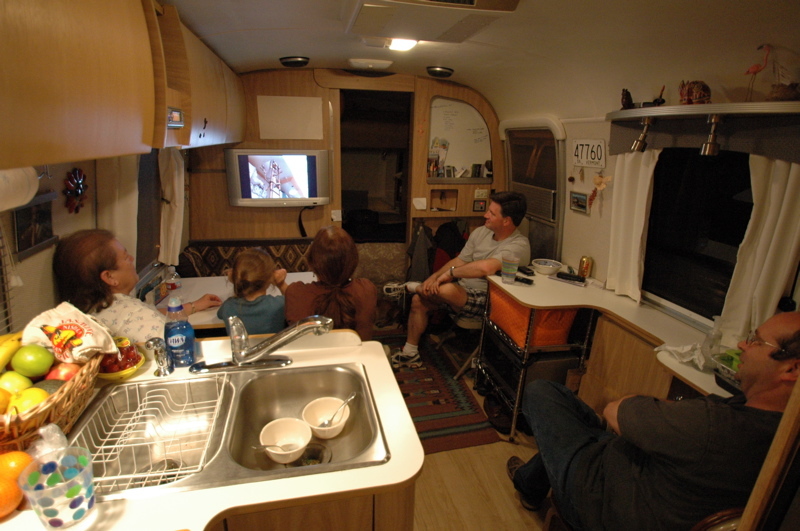 Thanks for your continued dedication and effort to educate and make the RVing experience fun and safe for us all. Looks like you’re putting that new wide-angle lens to good use, already. I love mine. Sorry about the brake problem; you’ve had more than your share of problems with wheels, flats and brakes. You need a break! See you in Death Valley! We’re almost there. I like the lens. Add Barry and a bucket of my soporific chicken to that last image and it would be just like old times at a FL rally. Looks like you guys are having a fun trip. Doesn;t sound like you are coming too far north in California but if you come through Ventura we would love to have you guys over. I like the lens too! Good shot. Rich, check out the Image Trends Fisheye-Hemi Plug-In to correct some of the distortion from your ultra wide angle lens. Theresa and I met you and yours in Borrego Springs with Bill and Larry over New Years. We have the 30′ SO. 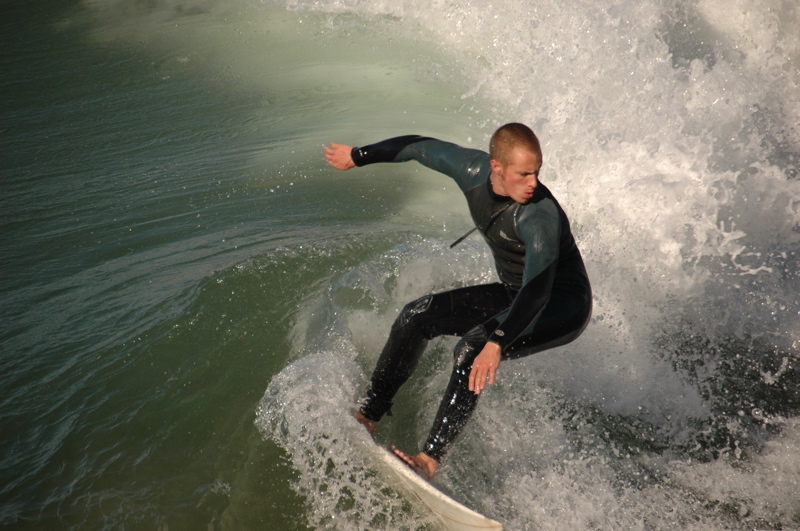 Love the shot of the surfer! Wish we were with you in Death Valley – If you go for a hike with Bert et al make sure to bring lots o’ H20!